Patrick Thomas has been rector of the Carmarthenshire hill parishes of Brechfa, Abergorlech and Llanfihangel Rhos y Corn since 1984. - Publisher Donald [A. M.] Allchin is Honorary Professor in the University of Wales in Bangor. 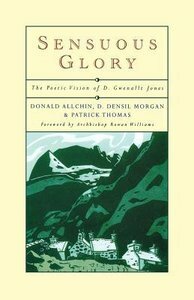 - Publisher Born a century ago, the poet D. Gwenallt Jones displays a rare spiritual authority that gives his work an increasing importance beyond his native Wales. His distinctive voice was shaped by his embrace of an impassioned Christianity in the face of the wars and bleak industrialism of the twentieth century, and potent images of tragedy confronted by hope and generosity are woven throughout his poetry. His precise descriptions of local people and places have a universal and timeless significance, becoming the badeground of apocalyptic powers of good and evil.Here the well-known writer Donald Allchin explores the international relevance of Gwenallt's writing, while D. Densil Morgan gives a critical assessment of the body of his work.These extended essays are followed by Patrick Thomas' new translations of thirty-five of Gwenallt's poems. Donald [A. M.] Allchin is Honorary Professor in the University of Wales in Bangor. Born a century ago, the poet D. Gwenallt Jones displays a rare spiritual authority that gives his work an increasing importance beyond his native Wales. His distinctive voice was shaped by his embrace of an impassioned Christianity in the face of the wars and bleak industrialism of the twentieth century, and potent images of tragedy confronted by hope and generosity are woven throughout his poetry. His precise descriptions of local people and places have a universal and timeless significance, becoming the badeground of apocalyptic powers of good and evil.Here the well-known writer Donald Allchin explores the international relevance of Gwenallt's writing, while D. Densil Morgan gives a critical assessment of the body of his work.These extended essays are followed by Patrick Thomas' new translations of thirty-five of Gwenallt's poems. Densil Morgan is head of the School of Theology and Religion and Islamic Studies at the University of Wales Trinity St. David. ?